Today is Aadi Velli, a very auspicious day.. Aadi month, which falls in the middle of July and August [ mid July- mid August] is the 4th month in the Tamil calendar.Veeli means Friday. And today is the first Friday of the Aadi month!! During this month religious observances take a prominent places especially to the Goddess related to Nature / water forces. Prayers are offered to protect them from in-auspiciousness and also to gaurd/protect them from natural forces in future.The whole of this month is dedicated to auspicious things like prayers and pujas so all other activities like weddings and other ceremonies are not performed during Aadi month. Due to the festivities, a lot of delicacies are prepared that are a highlight of the month. One such dish is the Aadi Paal or Thengai Paal Payasam. 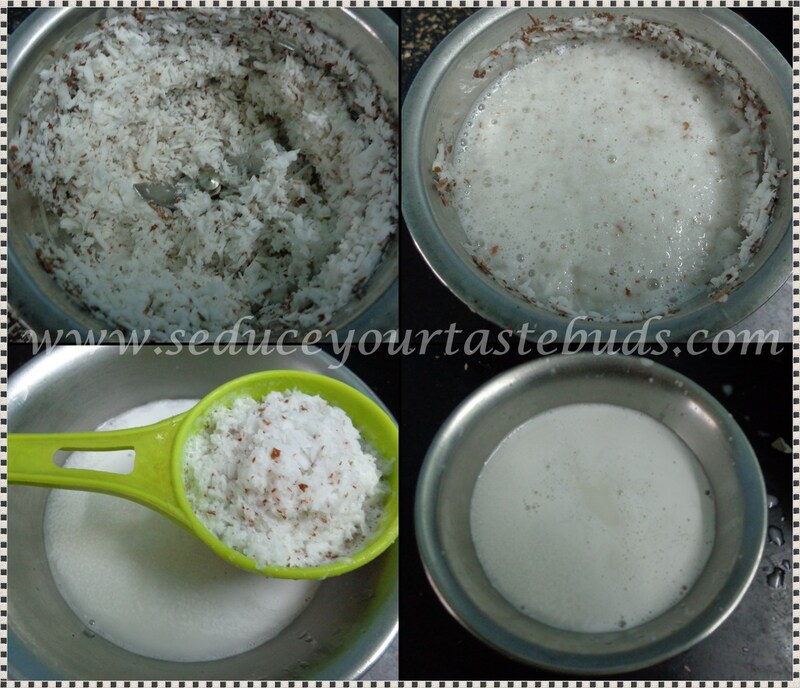 It is a delicious concoction of coconut milk and jaggery and is very, very easy to prepare. I read that this payasam is prepared on the first day of Aadi to celebrate the beginning of the new month also called Aadi pandigai. We generally don’t celebrate this festival as it is not a part of our custom but since we have been in Tamil Nadu long enough, their culture and customs have seeped into ours. And being a food blogger , I have this interest to record the dishes that go with each festival / function from around here. Grate coconut and add hot water ,a little over 3/4 cup and let it sit for a minute. Grind it in a mixie.Pass it through a sieve and using the back of a spoon squeeze out as much milk as possible. This is the first extract. Keep it aside. much milk as possible. This is the second extract. Keep it aside. In a vessel take the jaggery and add a little water till the jaggery submerges.mash out the lumps and filter. Keep aside. This should be around 1/4 cup. Else make it up to a 1/4 cup adding water. 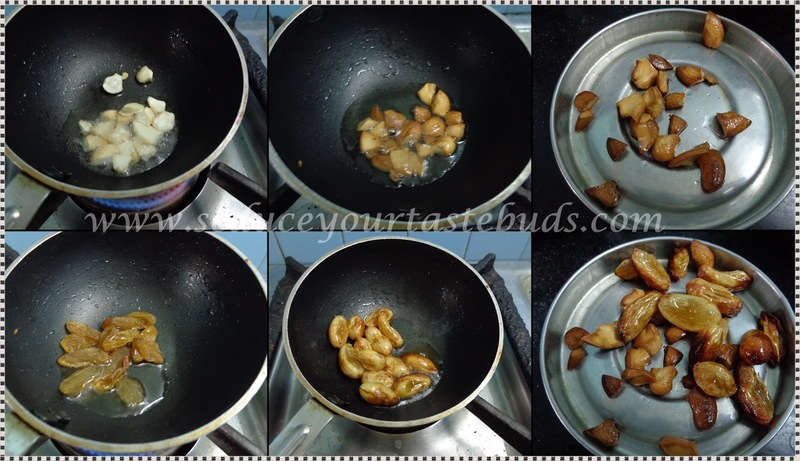 Heat ghee [or oil for a vegan version] and fry the cashew till golden brown.Drain and remove to a plate.To the same pan add raisins and remove from pan once they puff up. Keep aside. Take the jaggery syrup in a pan and bring it to a boil. Let it thickens to a honey like consistency, but not thicker than that. Add the second extract of the coconut milk and simmer. 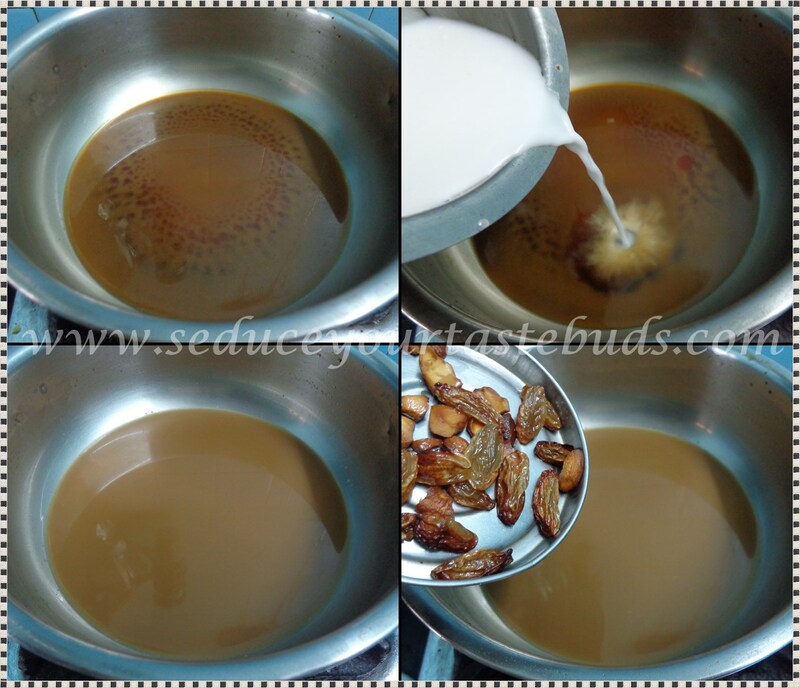 Once it comes to a boil, switch off the flame and add the first extract of the coconut milk.Mix well. Add the cardamom powder and the fried cashews and raisins. I used 3/4 cup of first extract and around 1/4 cup of the second extract. Do not heat the kheer after adding the first coconut milk extract. It will curdle. You can also add a few threads of saffron dissolved in milk , a pinch of edible camphor along with the cardamom powder. The sweetness was just right. Adjust the jaggery to suit your taste. I am planning to post some other special dishes that are made during the Aadi month.So stay tuned….